Many years after the One Ring was seemingly lost, a growing shadow threatens the peace of Middle-earth. The power of the Dark Lord Sauron gains strength and is again spreading, finding servants of all races to carry out his bidding until the One Ring can find its way back to him. As the ancient armies of Sauron are waking, preparing for the battle to end the Third Age, the race of Men face a threat from within. Sickened by unseen evil, perhaps even by a subtle poison, King Theoden must rely on his highest advisor Grima Wormtongue to keep command of Rohan. But this dark evil has also weakened Grima's loyalty to his people. As the henchman of Saruman, Grima is tasked with misleading Theoden and weakening Rohan against the attack of Sauron's army. Stealing away relics of Theoden's triumphs, Grima breaks the once powerful King's spirit. The stalwart leader is reduced to illness and despair, reliant on Grima's counsel ever more, as Grima's misdeeds create an irreversible breach in Rohan's strength. 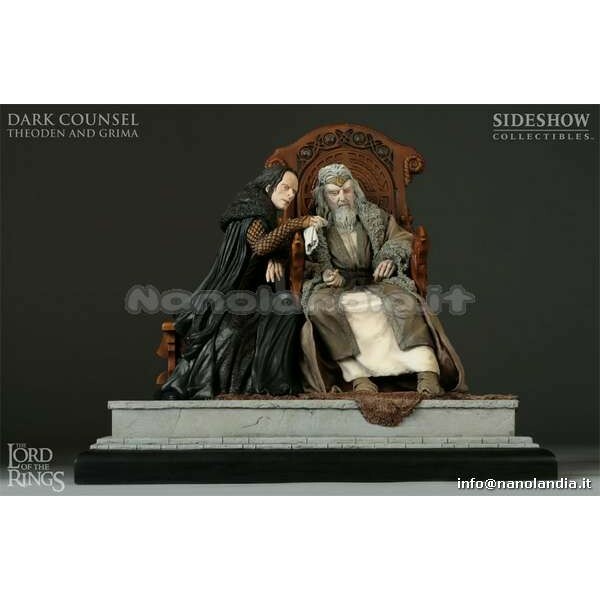 Sideshow Collectibles and New Line Cinema are proud to present the latest release in the series of The Lord of the Rings Dioramas, Dark Counsel. This evocative diorama depicts Grima's act of treason as he offers misguided advice to the weakened Theoden, leaving the city of Men open to attack. Sculpted in approximately 1:9 scale, each piece is cast in high quality polystone, hand-finished, and hand-painted to exacting standards. 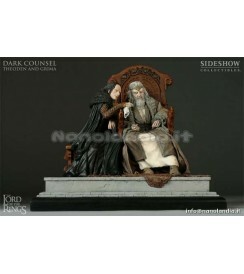 The Dark Counsel Diorama is a fine addition to any The Lord of the Rings collection.